Overactive brain circuitry can trap clients in cycles of rumination that can keep them anxious and depressed. 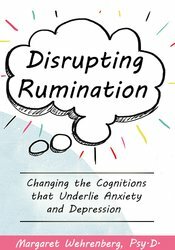 Letting go of ruminating worries, or banishing persistent thoughts, like I’m not good enough or I’m worthless, isn’t easy for clients and when ruminations don’t shift, therapists can begin to feel stuck themselves. Watch Margaret Wehrenberg and she will examine why clients lock into depressive thought patterns and why they feel they need to hold on to worry. You will learn practical interventions to use in-session for eliminating these patterns and replacing them with attitudes of calm and competency. Articulate methods to help clients identify perfectionism in thought and behavior and explore treatment interventions to decrease symptoms of anxiety. Evaluate the negative impact of rumination on the brain structure and function to inform the clinician’s choice of treatment interventions. Ascertain the underlying neurological processes that impact depression symptoms in clients.